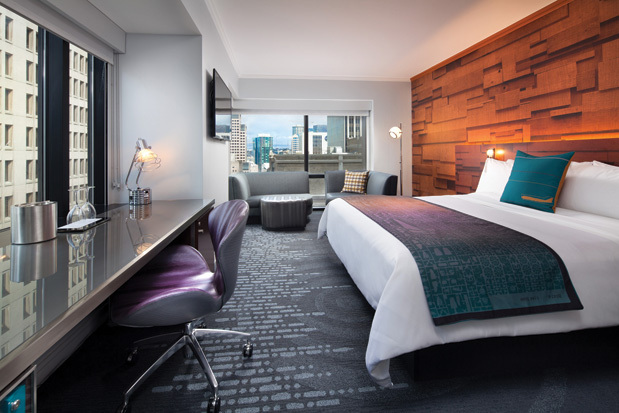 Hotel guests will feel like they’re checking into the great outdoors with the debut of the W Seattle’s Pacific Northwest–inspired guestroom renovations. Each of the 415 guest rooms and nine suites of the downtown hotel have been redesigned to reflect Seattle’s history of aeronautical innovation and outdoor recreation. Illustrating these influences are design details such as each room’s “lodge wall,” printed with a 3-D log-cabin pattern, throw blankets printed with a pattern of airplane parts from Boeing 747’s model kit, and cockpit-inspired desk lighting. “We could see that Seattleites are naturally connected to their region with a close relationship between urban and rural,” says Kajsa Krause, principal of Krause+Sawyer, the design firm spearheading the project. Drawing on Seattle’s musical history, the renovation also includes the installation of the W Sound Suite: a private music studio and writer’s room, where professional musicians as well as hotel guests can stay and record while on the road (price upon request). Complete with a control room, mixers and microphones, The Sound Suite is also soundproof, so all hotel guests are still promised peace and quiet.